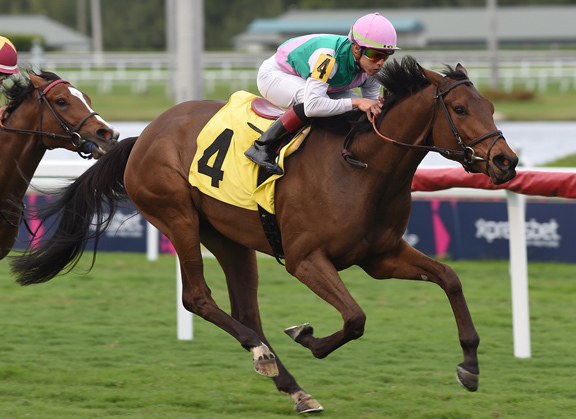 The highly regarded ‘TDN Rising Star’ Hidden Scroll (Hard Spun) isn’t the only promising 3-year-old debut winner to carry the famed green-and-pink silks of Juddmonte Farms this winter at Gulfstream Park. Clause (f, 3, Speightstown–Red Herring, by Empire Maker) stamped herself as another one to watch from Prince Khalid Abdullah’s operation with an eye-catching, come-from-behind win going a two-turn mile over the lawn in Hallandale Saturday. Trained by Chad Brown, the bay earned a very strong 82 Beyer Speed Figure. Clause’s dam Red Herring–a half-sister to Phoenix Tower (Chester House), GSW & MG1SP, $653,182–won two of four career starts, including a first-level allowance over the Woodbine synthetic for Brown’s late mentor, the great Bobby Frankel. This is the extended female family of 2003 G1 French Oaks heroine Nebraska Tornado (Storm Cat). The 13-year-old Red Herring is also represented by the 2-year-old colt Redshank (Speightstown), who is currently in training in France with Andre Fabre. Red Herring was bred to Flintshire (GB) for the 2019 season and is expected to foal within the next two-three weeks, per O’Rourke. Juddmonte, of course, has enjoyed success with the WinStar Farm stallion Speightstown before, capturing the 2013 GI Hollywood Derby with Seek Again. The aforementioned Hidden Scroll, hammered down to 7-1 in last weekend’s GI Kentucky Derby Future Wager off the heels of a jaw-dropping, double-digit debut romp in the slop for Hall of Famer Bill Mott Jan. 26, could go next in the GII Xpressbet.com GII Fountain of Youth S. at Gulfstream Park Mar. 2.